Boracay - Boracay Island, with its sugary white sand beaches and azure blue waters, is located on the northwestern tip of Panay, Western Visayas. The best of the island is the 4 km. White Beach, touted as the “finest beach in the world.” The water surrounding the island is shallow and the sand is finer and brighter than most beaches in the archipelago. Pagudpud - In the Northern part of the Philippines is a beach reputed to have the longest contiguous white sand with mighty waves and strong winds that can compare to Hawaii. Wind and wave surfing are the outstanding activities that Pagudpud beach offers its very discriminating clientele. Not to mention the inviting views, clear blue waters, and white sand. Pagudpud promises its visitors a magnificent experience in a secluded paradise. Mactan Island, Cebu - Lying in the heart of Cebu is the island of Mactan. This tropical-island getaway endowed with a variety of colors – from its beach, hotels, resorts, nightlife, music, food, drinks – will guarantee to spice up every tourist. Panglao Island, Bohol - Panglao is the perfect place for a great dive and beach holiday. It is a small island on the Philippines southwest of the bigger island, Bohol. 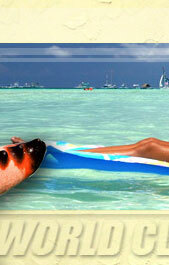 On the southern beach of Panglao there are several resorts that line up on the beach. Camiguin - Camiguin, which rhymes with “come again,” has been regarded as the most beautiful island in the country. As such, it is also referred to as the Philippines’ “Garden of Eden.” The presence of a number of majestic waterfalls that create both hot and cold springs is only one of the many attractions of this island-paradise. The topography is unmistakably tropical but the ambience is uniquely occidental. A study in contrast, Camiguin is sure to mesmerize anyone who visits with the itch to be back again soon. Honda Bay, Palawan - Framing the rugged and intriguing coastline of the capital of Palawan, Puerto Princesa City is Honda Bay. Its blue cool waters are dotted with islets that assure one of a pure-pleasure experience. From snorkeling in its clear waters to the more adventurous island hopping within its enclaves to simply having a picnic in the fine sand of its beach areas, Honda Bay is sure to leave a lasting impression on the visitor. El Nido, Palawan Dominated by towering marble cliffs that are homes to a number of tropical birds, El Nido is the source of one of the most delectable soups specially found in Chinese restaurants – the Nido Soup. This soup consists mainly of the birdnests that abound in the area. But El Nido is more than this. It prides itself in having the most beautiful seascapes in the province of Palawan, known as the country’s last frontier. Because of its utter splendor, it has also been called the island of the gods – heaven on earth, that is El Nido. 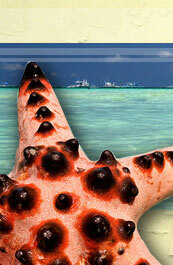 Pearl Farm Davao - Pearl Farm is located in the Samal Island off the coast of Davao City, Southern Philippines. The premier beach resort, which lies in the pristine island of Samal, used to be a pearl farm. There thousands of white-lipped oysters, transported form the Sulu Sea, were once cultivated for their pink, white, and gold pearls. Today, beach lovers all over the world visit this world-class beach resort for its white sand and panoramic landscape and seascape, bringing with them the memory of a lifetime – a relaxing private retreat in a tropical paradise. Siargao - Siargao, located in the province of Surigao del Norte, is renowned for its curling waves that soar from nine to twelve feet high. It is frequented by surfers from all over the world. Besides surfing, the island of Siargao is well-known for its unspoiled beaches and its rural charm. We offer White Sand Beaches, Diving Resorts and Resort Hotels in Boracay, Bohol, Cebu, Davao, Palawan, Puerto Galera and other tourist destinations in the Philippines. The Philippines is located in the southeast portion of the Asian continent.